If you follow me on Instagram ( @avizastyle ) or Snapchat ( @avizacard ) you know that this past weekend I was in Southern Virginia at Lake Gaston with 27 friends. Yes you saw that right, 27 people in one house. It sounds crazy, I know, but this was actually our 3rd annual lake trip with roughly the same group of people. Truth be told, I don't really love large group outings (I blame this on failed immature group beach trips in college). So many people confined to one space is a bit overwhelming, but this group is pure perfection. No drama, just fun in the sun (and plenty of mimosas!). I scored this suit at the Mara Hoffman online sample sale at the beginning of the summer for a crazy price but have only had the chance to wear it in Vegas (seen here). Luckily, I wore the monokini almost the whole trip because it was just so comfortable and hid my insecurities so I was free to frolic around. 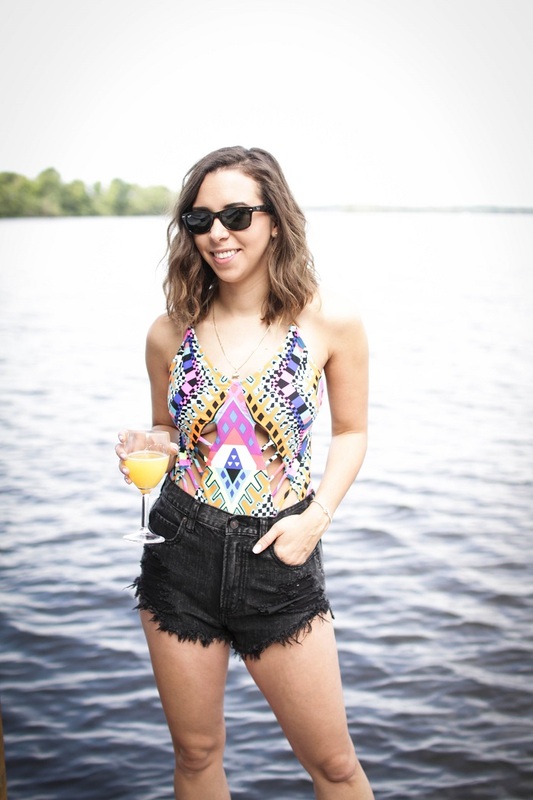 Even though the summer is winding down, have you tried the one-piece trend yet?? The cut and print of this suit are so fun! 27 people is a lot in one house, but if you have the right group it’s so much fun! 27 is a lot! But I am sure it was a lot of fun! I'm also in love with this swimsuit. Amazing! Love that swimsuit!! Next time you gotta give a girl a heads up when there's a Mara Hoffman sample sale ;) ;) I just snagged a one-piece Trina Turk that I can't wait to wear on our trip to St. Lucia next week!! I'm late to the game, but better late than never! Loving the bathing suit paired with distressed shorts - he perfect summer look! Mara Hoffman makes the best swimwear - I love her prints! I saw that you were away at a beach house on snap chat, but WOW, I didn't realize there were that many people! I'm a big fan of smaller group outings too, but if there's no drama and plenty of mimosas, I would bet that would be a great time!